These photographs, made over a three year period, uniquely focus on the ceremonial uses of the Chapeyoko Mask by the Tarahumara people. Since 1998 I have traveled with ethnologist and guide, “Santiago” James Barnaby, deep into the Copper Canyon area of Mexico to photograph remote areas of Tarahumara lands known for their cultural richness. In 2006 Barnaby realized that the centurys old tradition of using the Chapeyoko masks had disappeared completely from an important area. 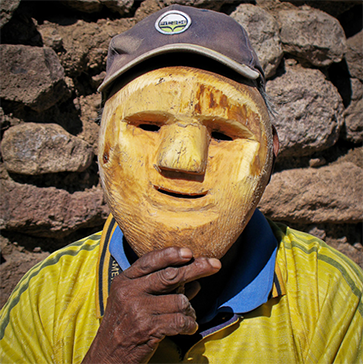 He met with village elders, dancers, and local carvers to persuade them to reintroduce the iconic mask into the dance. In spring 2007, I was invited to photograph this historic event. What I have often experienced during the Mate Chine dance is being mesmerized by the repetitive refrains in the music, the sound of dancers’ feet on the hard-packed earth, the rattle‘s whirr, and the chapeyoko’s call. Visually it can be magical and most especially so at night with the masks lit only by warming fires. These images are my attempt to gather and hold in my camera, the mystery and magic of the dance as experienced late at night. There remains, in remote areas of the high Sierras back country, an undeveloped wilderness where “the people” gather to celebrate. Here, the ancient world is visible. Photographs from The Reintroduction of the Mask were published by the Southwest Center in the Journal of the Southwest, summer 2008 edition, through the University of Arizona at Tucson.